I am aware that in the several posts to my blog whilst travelling in the last three weeks, that many of the photographs particularly those which were taken in portrait mode were inexplicably elongating to the point of being irritating and worthless to view! I think I have solved the problem and by redesigning the site and using a more simple template it would appear that the issue is resolved! Have a review and tell me if it has not rectified the problem. I’m now safely back in Australia and return to work with a vengeance! Summer swimming has ceased and so I will probably be cycling more frequently and perhaps getting to the gym once or twice a week. To my disappointment, a new production of one of my favourite musicals was about to open in London the week after I left! If it is in London now there is the possibility that hopefully it will appear in Australia in the next few months or at least during this year or possibly next. Many of my readers might be fascinated to learn or to see me playing the recorder especially as it seems to occupy a significant part of my blogs and whether I’m playing in the toilet or the gymnasium of the hotel, I think I’m slowly improving! Hopefully in the next few weeks I can upload a video of my musical endeavours! Now that I’m back in Australia unfortunately the frequency of my blogging will decrease but there is the tantalising prospect of further holidays in September when I will be going to Istanbul and then joining a swim trek around the Greek islands for a week! Then cycle down around the south of Italy! If you want to join me, start training! An American woman, I would estimate in her early 50’s (although Botulinum is not known as a ‘toxin’ for nothing) enters the hotel gym. I was until then alone, saddled on a cycle machine, with my sheet music on the computer screen, an excellent music stand. Rather than climbing the virtual Pyrenees, I am scaling C major. The America, with rather tight leotards and face to boot, encourages me to continue. I decide that it would be better to attempt a recognisable tune, rather than scales, and launch into ‘Greensleeves’. I finish with a flourish and I do confess with a slight degree of satisfaction as I played it rather well. This was confirmed by the sole member of my captive audience who exclaimed breathlessly “that was beauooooootiful!” Pausing to take a mouthful of Spring Water, she enquired if I was a “professional musician?” No, she was serious! Demurely I said no I was simply learning to keep my brain active. I was on a roll here so I said of course that was “Greensleeves”. Yes she said……. its a wonderful Christmas Carol. Feeling rather Peter Sellarish, I then ventured that it was composed by King Henry V111. Now that you mention it she said, as she picked up speed, I do recall that. He was very talented wasn’t he. This being more of a statement than a question. By now I quickly realised that I could safely return to my scales, the Adagio from the Mozart Clarinet concerto, my signature piece, would fall on deaf ears. The Academy was founded in 1822 and is the oldest musical conservatoire in Britain. It is devoted to educating and training some of the world’s greatest musicians. The museum is an outstanding and fascinating collection for anyone with an interest in music. It has had bequeathed some remarkable and unique collections including those of Sir Arthur Sullivan and Yehudi Menuhin. The original score for ‘Three Little Maids from School’ is showcased as is a picture of an adolescent Menuhin with Sir Edward Elgar – of ‘Land of Hope and Glory’ fame. The inaugural Professor of Singing was one Manuel Garcia, also the longest serving from 1848 to 1895. He taught Jenny Lind. In fact she was Swedish and as a soprano was world renowned, known as the ‘Swedish Nightingale’. She was self taught and blessed with a natural talent, but without guidance had a vocal breakdown. Apparently her vocal cords were severely scared. She was taken under the wing of Professor Garcia who as a consequence of his insight and talent, invented the first laryngoscope all the more to peer down Ms Lind’s throat. So the laryngoscope was not originally a medical device but rather a sort of musical instrument, usurped by the medical profession, skillfully played by them to make millions. Apparently Hans Christian Anderson fell hopelessly in love with Ms Lind. The Danish writer, I had a preconceived notion that he was a bit of a fairy, wrote children’s tales. Obviously I got this around the wrong way? The founding Principal of the Music school was one William Crutch. A child prodigy himself he took under his wing gifted children from age 10 to 15 and mandated that they all boarded. A typical school day was from 7am to 9pm each day beginning and ending with prayers. I shall send a memo to the Hon Christopher Pyne MP Minister for Education suggesting, respectfully of course, that he could consider and adopt this regimen. Rumour has it that Mr Pyne already practices this and is indeed at work from 7 am to 9pm and as well is on his knees on a daily basis. If only I could somehow weave Mr Crutch, the teacher, into my memo. The Museum has two floors of priceless musical instruments, one floor devoted to string and one to the piano family, which is of course technically part of the string family, by string I mean the violin, viola, cello and lute etc. There is a Stradivari violin played by Queen Marie Antoinette. I guess she was the French equivalent of the Emperor Nero who fiddled whilst Rome burnt. Marie Antoinette on the other hand fiddled whilst the peasants ate cake. The piano section had amongst other things a polygonal virginal.The juxtaposition of these two words absolutely stumped me. 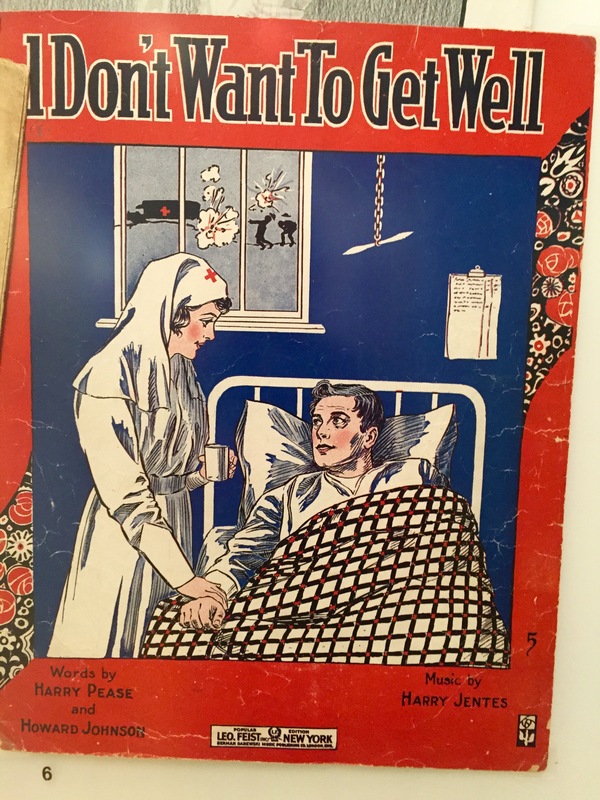 The museum has a changing temporary exhibition and at present it is a delightful nostalgic look at the Music of the First World War. The songs of the era and sheet music were cleverly displayed and there is no doubt in my mind of the delicious inneundo and double entendre of some of the songs. Here are some pictures of what I mean. So what do the bad boys love?